Life at IDEA School of Design is like living in the fast lane. Everything seems to be moving by so quickly to the point that it can be overwhelming (though just knowing how to manage time fixes it). It's so much fun plus I can't deny that it feels cool to be in a full-time art program. This is such a great self portrait! My intention in the arrangement of posters, piles of books and video games in the photo (above) was to convey my hobby of being a collector of sorts, my various influences, and the fact that I'm a major Zelda fan all in one. The pose I chose was to project my tendency to multitask, while the location shows that I value comfort. I have been the most productive I have ever been, there are valuable principles to be learned, but most importantly, I get to experiment with different mediums. I had to create something that could be associated with the medieval time period and made an accordion book with time-appropriate calligraphy since it would be the time period that books or compact forms of writing would the biggest invention. It’s a big challenge but results in some pretty cool projects, such as an oil painting (shown below) and literally making my own medieval artifact (shown above). 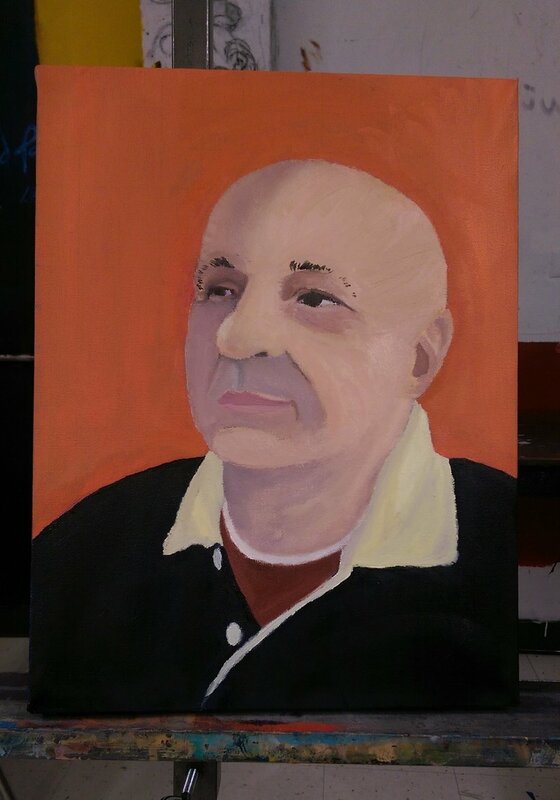 For this project, I had to do an oil painting of someone I knew, so I decided I would paint my Dad.